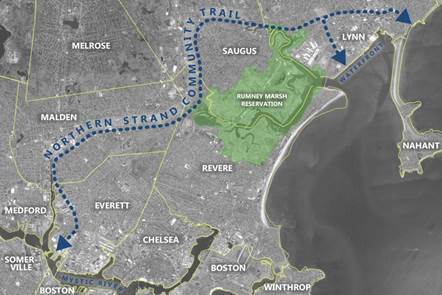 Design Work Begins on Trail Under State’s $1.5 Million Award – Bike to the Sea, Inc.
Design work began on April 11 and will continue through early May on the Northern Strand Community Trail, running through Everett, Malden, Revere, Saugus and Lynn. The trail remains open while this work is being conducted. The field work includes environmental resource area flagging by staff from LEC Environmental; traffic counts for roadways that the trail crosses by Stantec Engineering; and a topographical survey by SMC Surveyors. These firms, under the leadership of landscape architects Brown, Richardson, and Rowe, have been hired by the Executive Office of Energy and Environmental Affairs to design and permit the Northern Strand Community Trail. In May and June, stakeholder engagement sessions will be held in each of the five communities to allow residents the opportunity to provide comment on trail design and construction. So far, meetings have been scheduled in Malden, Revere, Saugus and Lynn. The funding, awarded through EEA’s Gateway City Parks Program, enables the design of the trail, development of bid-ready construction documents, and receipt of all necessary construction permits. Most of the trail — from Everett, through Malden, Revere, and Saugus — is cleared and being used by walkers and bicyclists. However, the Lynn portion still needs to be built. A separate team hired by the City of Lynn and Solomon Foundation will design the on-road section of the route in Lynn. The teams will coordinate their efforts and produce a single unified design for project bidding and construction. When completed, the trail will span ten miles along the rail bed of the former Saugus Branch Railroad. The investment to the Northern Strand Community Trail advances a key Baker-Polito Administration initiative. Recently, Governor Baker established an Interagency Trails Team, which is led by the Governor’s office and is comprised of staff from EEA, the Massachusetts Department of Transportation (MassDOT), and the Department of Conservation and Recreation (DCR). The purpose of the team is to help develop a unified vision for a trails network and translate that into strategic investments, policy innovations to facilitate development of trails, and shared partnerships with municipal partners. The Northern Strand Community Trail project is a direct result of the group’s “one team, one plan, one vision” approach to advance multi-use trails across the Commonwealth.